How About a Toll Bridge to Raise Money for the Indian River Lagoon? 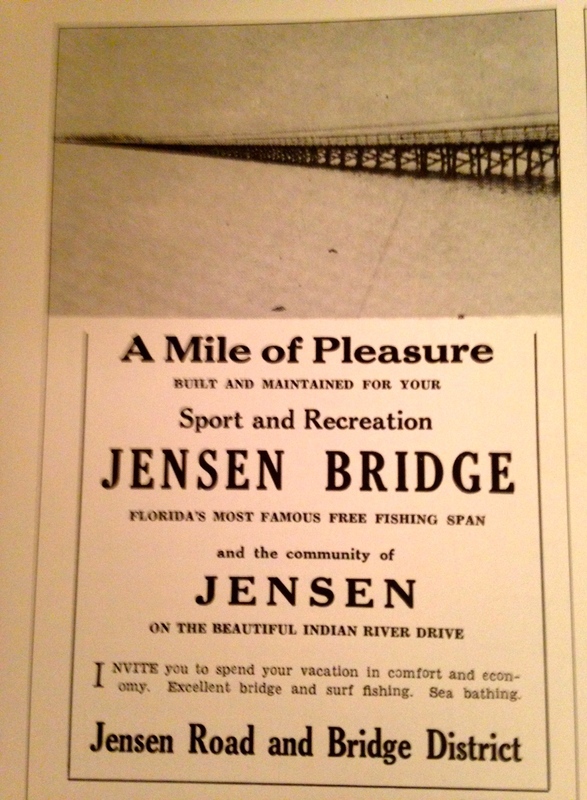 The idea of a toll bridge over the Indian River Lagoon is not a new one as there were toll bridges in Jensen and Stuart in Martin County’s early days. 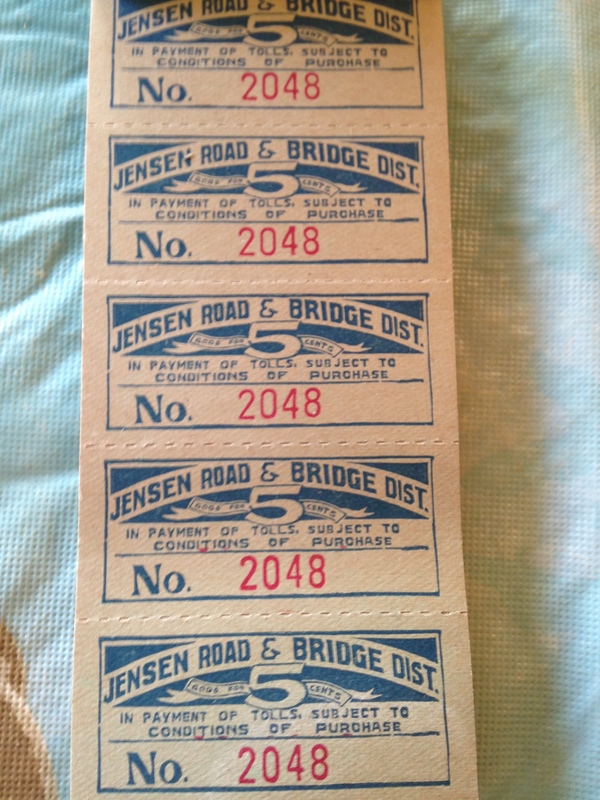 Toll Tickets for the Jensen Bridge. Courtesy Bob Washam. 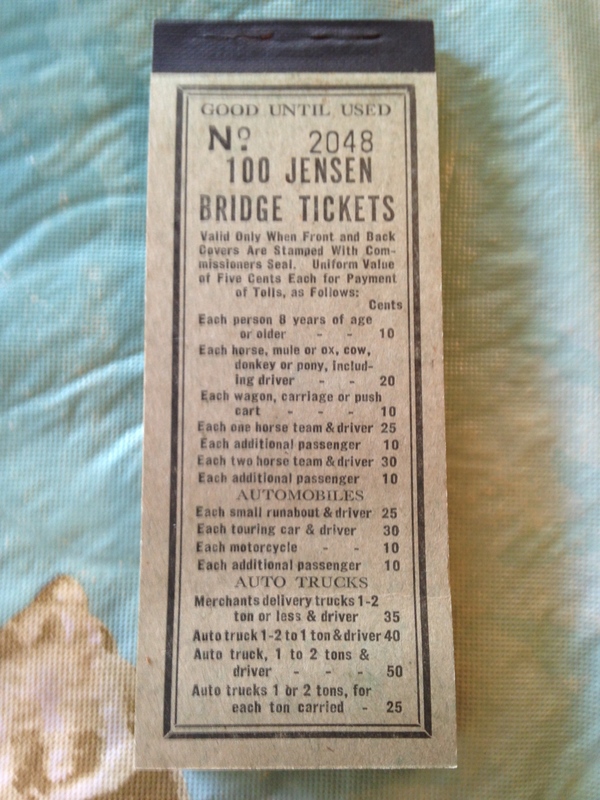 Cover of toll ticket packet for Jensen Bridge. Courtesy Bob Washam. Over time, we have had caution for people, but not for fish. 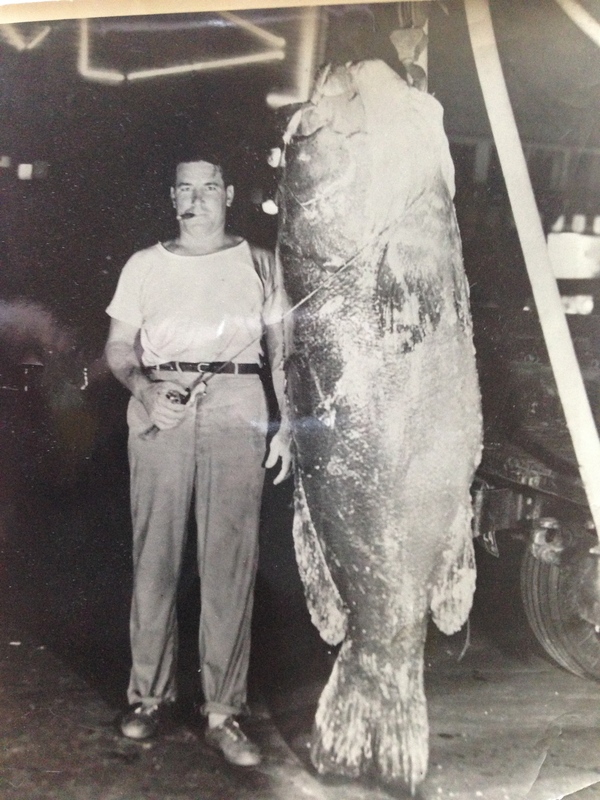 Unidentified man with Goliath Grouper caught in Jensen area. Photo courtesy of Bob Washam. Today the Indian River Lagoon is still famous for fishing, but also for its seagrass loss and declining fish stock. Yesterday, my father gave me an issue of Florida Sport Fishing, the lead article was entitled “Gator County, Florida ‘s Famed East Coast Lagoon System May No Longer Be the State’s Premier Destination for Giant Trout,” by Jerry McBride. Most of this seagrass loss may have happened north of us, but it is here too. Also, the lagoon is one waterway, whether it is Lake Okeechobee and local canal releases here in Martin County, or brown tide in the central and north lagoon, we are all affected. Usually on Friday I try to post something positive and happy. I have been wanting to share friend Bob Washam’s Jensen Bridge photos, today was the day. Nonetheless, I could not ignore the slow and now pronounced losses to our Indian River Lagoon, especially in light of Mr Treaway’s article this morning. Thousands of dead hardhead catfish are floating in the Indian River Lagoon from Palm Bay to Fort Pierce. Because only one species is affected and all the dead fish are juveniles mostly from 4 to 12 inches long, a local marine biologist believes the cause is a specific virus rather than poor water quality in the lagoon. Weve had die-offs like this in the lagoon before, where only sea cats and nothing else was dying,said Grant Gilmore, lead scientist of Estuarine, Coastal and Ocean Science in Vero Beach. The cause was a viral infection back then, so I would assume its the same this time. Kelly Richmond, a spokeswoman at the Florida Fish and Wildlife Conservation Commission laboratory in St. Petersburg, said the agencys hotline has received 16 reports of dead catfish beginning Monday. Staffers collected three live catfish and water samples from the lagoon for analysis. Results should be available early next week, Richmond said, and the agency wont guess at a cause until then. Paul Fafeita, a Vero Beach fishing guide, said he saw dead catfish Wednesday morning in the lagoon from the Barber Bridge in Vero Beach to the North Causeway bridge at Fort Pierce. Im talking hundreds, if not thousands of dead fish,Fafeita said.­They werent sporadic, one here and one there. They were steady, up and down the lagoon. Mike Peppe, a Sebastian fishing guide, reported seeing dead catfish Wednesday in the lagoon from Wabasso to the Sebastian Inlet. They were everywhere,Peppe said.There had to be thousands. Look down and youd see a bunch of white things in the waterthe catsbellies. St Lucie River’s Demise/How Did We Get Here? 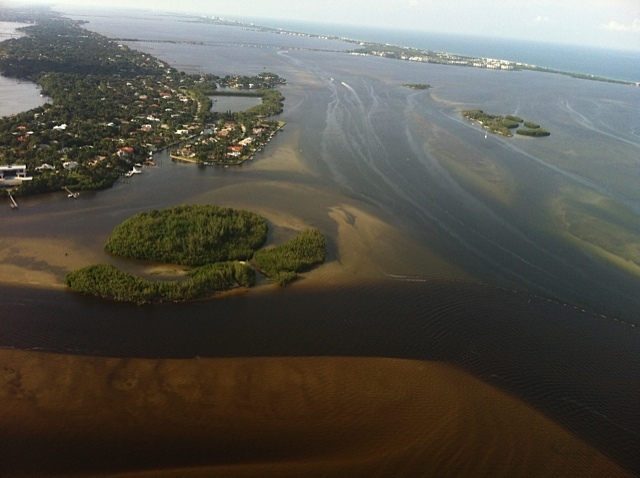 You may wonder, “how we got here,”to this polluted Lake Okeechobee sewer running through the St Lucie River/Indian River Lagoon and the Calooshahatchee? In order to do so, we must go way back. Florida was poor and the legislature wanted to build its coffers, so when the “Swamp Land Act of 1850” transferred twenty million acres from the federal government to the state of Florida, of course the state legislature had dollar signs in their eyes. From 1851 to 1885 the Internal Improvement Fund, overseen by the Florida Governor and his cabinet, sold swamp lands, and others, to the railroad companies ; with the money the state made, it built canals and drained more lands, an endless and helpful cycle for building the state’s immature economy. By 1864, at the end of the Civil War, Florida was broke and it wasn’t until 1881 when Hamilton Disston entered the picture that draining the land started again. Disston paid for the land and started draining it by running a canal through the Caloosahatchee River on the west coast to Lake Okeechobee in the interior as well as parts of the Kissimmee River. The lake dropped substantially; Florida would never be the same. Disston ended up committing suicide due to the Panic of 1893, but he inspired generations of drainers to come. As early as the mid 1800s, the legislature had discussed draining Lake Okeechobee through the Caloosahatchee and the St Lucie rivers . By 1923, this had been accomplished, on a shallow level, creating a water way across the state through Lake Okeechobee. At the same time, agriculture south of the lake excelled in the the rich soils that had been reclaimed from the great swamp. The state was happy and “feeling rich.” However, within only a few years, the country had fallen into the “Great Depression” and Mother Nature brought Florida to its knees. The hurricanes of 1926 and 1928, together, killed thousands of agriculture workers when the water of Lake Okeechobee went south, as nature intended. The outcry from the local and state governments of Florida made it to Washington DC, and the true dependency on the the Army Corp of Engineers began. By 1938 the Herbert Hoover Dike had been built around the once magnificent lake until another hurricane, in 1947, flooded the agriculture south of the lake again. 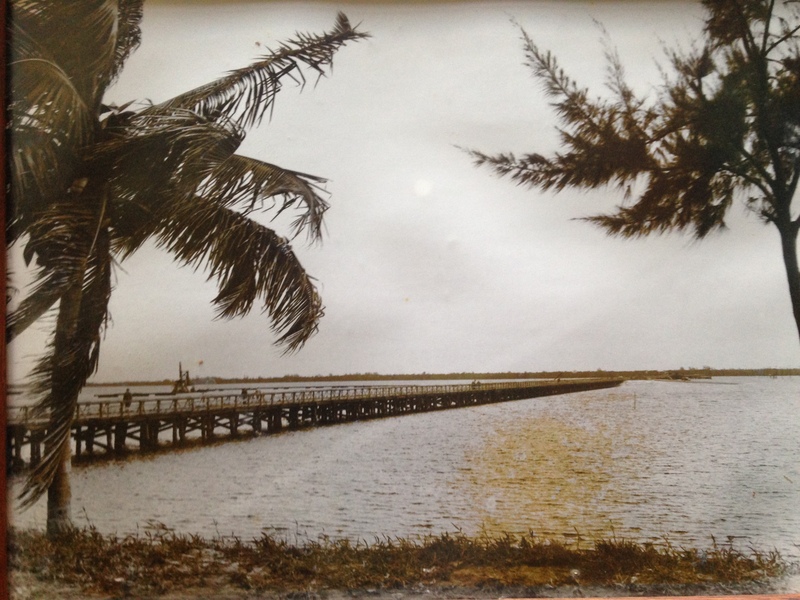 As it had done after 1928, the Army Corp dug the canals of St Lucie and the Calooshahatchee deeper and wider. Eventually, the Central and South Florida Flood Control Project was formed by the state and federal government for seventeen counties; its headquarters was placed in West Palm Beach, today the headquarters of the South Florida Water Management District -which the flood agency eventually morphed into. More canals and pump stations were constructed and by the 1960s most of what was eventually called the Everglades Agriculture Area, 700,000 acres south of the lake, would grow primarily sugar. These sugar families became very powerful and influential in government and remain so today. It wasn’t until the 1970s, under Governor Rubin Askew, that the environment and natural resources became “important,” as the conservation movement of the time demanded such. To this day, the environment is certainly last in the mission of Florida’s government and today’s sick and polluted waters of the St Lucie, Indian River Lagoon, and the Caloosahatchee attest to this. For 168 years the state of Florida has protected agriculture above all others. In light of the state’s history and prior poverty, this makes sense. Nonetheless, a lot has changed in 168 years. We’ve had a civil war, slavery has been outlawed, women can vote, children are no longer used as common labor, and we have an African America president. Don’t you think it’s time to change how we drain and destroy our rivers?